Thermal imaging is one of the best diagnostic tools used in identifying lameness. As all horse owners know, finding the root cause of lameness can be difficult and even working out which body parts are involved – back, shoulder, hip, legs or feet; can be hard. With thermal imaging, inflammation or nerve damage is identified using an infrared camera. The camera picks up differences in the heat pattern which radiates from the animal, showing where the injury is. Once the injured area is located, treatment can then be initiated by the horse owner. Thermal imaging can survey the whole surface of the animal including hooves. It has been proven that injury and inflammation can often be seen using a thermal camera up to 3 weeks before clinical signs show in the animal. This therefore makes it an excellent tool to identify small subclinical injuries as well as the obvious lameness’s. Thermal imaging is also an excellent monitoring tool to track the progress of recovery and to show when the injury is healing and capable of work again, rather than just turning the horse out for weeks or months at a time. Many poor behavioural issues stem from an animal in pain. In particular when a horse has a sore back and/or poorly fitting saddle their behaviour and movement can change for the worse. Thermal imaging is an excellent way to identify if and where a horse’s back is sore or inflamed. It will show muscle, ligament and bony damage along the spine. 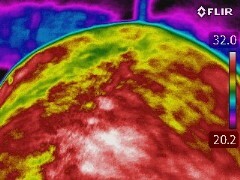 Thermal imaging is probably the very best way to check a saddle for fit. The saddle is lightly ridden in and then a thermal image is taken of the underside of the saddle immediately it is removed from the horse. This enables problems such as pinching, bridging and uneven pad pressure to be identified. This is the only clear way of identifying what is happening at the horse/saddle interface- an area which we cannot normally see, measure or judge. At the same time an image is taken of the horse’s back to identify any problem areas caused by the saddle. 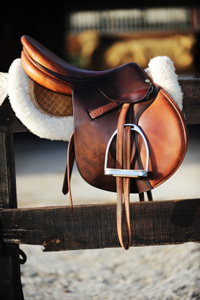 This information can then be used to guide a saddler in adjusting the fit of the saddle, or making the decision that the saddle does not suit the horse in question. If you suspect a muscle, tendon or ligament injury, thermal imaging can help identify the precise area of damage, so that treatment can be initiated. Purchasing a horse can be a large investment. If that horse also has an underlying problem it can lead to a lot of heartache trying to identify the problem, treating it and perhaps not realising your goals with the horse in the short term, or ever. Thermal imaging can be used to monitor horse health prior to purchase. It is an excellent way to identify any inflammation, soft tissue, or ongoing bony injuries that may be present. It will then allow the potential purchaser to make an informed decision about the nature of the injury. 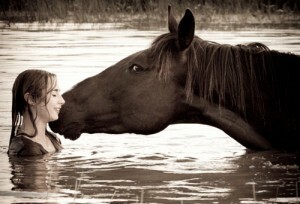 Naturally the horse owner’s permission is required to undertake the imaging. Thermal imaging allows you to start treatment and resolve problems in your horse sooner and more effectively than many other diagnostic modalities, at a very affordable price. Equine scanning can be used to monitor ongoing treatment progress and recovery. This can save money, time and ultimately, distress.